Polished gold or silver-tone bookmark with Berkeley Divinity School seal medallion. 11 oz ceramic coffee mug. Best when used every morning. The Pearl Crescent Hypodown comforter is a deliciously soft and puffy comforter with a unique hexagonal baffling design. Made from 330-thread count long staple cotton sateen, this fluffy comforter billows dreamily over a bed, making it irresistibly inviting. Hypodown comforters are filled with a hypoallergenic mixture of pristine Hungarian goose down and naturally hypoallergenic Syriaca clusters. Not only are Hypodown comforters amazingly luxurious, fluffy, and warm, they are tested by allergy doctors and guaranteed to be allergy-free. Polished gold or silver-tone cufflinks with Berkeley Divinity School seal medallion. 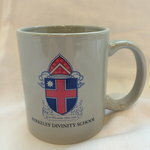 Gold or silver-plated lapel pin with Berkeley Divinity School seal medallion. 3/4" diameter. Gold or silver-tone letter opener with Berkeley Divinity School seal medallion. 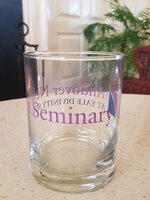 Engravable (service not available at our store): 7 1/4" long. Gold or silver plated money clip with Berkeley Divinity School seal medallion. 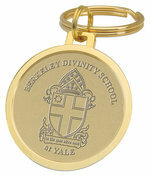 Gold or silver-tone, brass, split-wire key ring with Berkeley Divinity School seal medallion. Gold or silver-plated tie bar with Berkeley Divinity School seal medallion. Hand carved by crafstman Woody Shook in New Hampshire, this cross is especially nice for celebrating the spirit of a special friendship. The cross is made from two pieces of wood: the dove of one cross and the outstretched hands of the other. When sold as a pair, each person has a piece of the other's cross. The silver line between hands and dove is zinc, a conductor of energy, affirming of the empowerment of friendships. The comma is made of black walnut. The nimbus is made of holly. The cross is made of myrtle. The UCC motto is to resist putting a period where God uses a comma. Hand carved by craftsman Woody Shook in New Hampshire, the cross contains the 4 elements of nature carved into each stem of the cross. Earth, wind, water, and fire are all recurring elements in nature and scripture. The two hands of this cross are designed to form a circle — a symbol of wholeness within a friendship between two people. The hands are set into a medallion giving the impression that the hands are encircled by a halo (or nimbus), the symbol for the presence of God. The cross is designed to be given in pairs, as a gift of friendship. Wood of cross: Purpleheart Medallion: Quaparobo Hands: Cherry and maple. Hand carved by craftsman Woody Shook in New Hampshire, the cross of joy celebrates how one can brighten the day of another just by being present. It celebrates how the simple acts of kindness are deep expressions of love that can heal and restore. 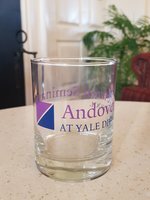 Hand carved by craftsman Woody Shook in New Hampshire, the Marquand Cross was carved specifically for Yale Divinity School. An exact replica of the cross atop Marquand chapel, the halo is permeated by flames of outward movement. Hand carved by crafstman Woody Shook in New Hampshire, this whimsical title for a traditional cross is well-suited for teaching us about the many aspectcs of Jesus' life. Learning from the different "stations" of this cross (hands, feet, heart, and head), our perspective of Christ grows. This hand-carved sunflower is a witness to deeper spiritual truths and practices: devotion, stewardship, service and the beauty of creation. The ten petals can be used as a counting tool to remember the Ten Commandments. The flower is set into myrtle, the Biblical wood of hope.